As Kiss announces its final tour for next year, let’s look back at the two live albums that cemented the hard-rock legend’s fame. In early 1975 Kiss, a rock band posing as comic-book superheroes, was battling its evil nemesis… a guy named Johnny Carson. Kiss’ struggling record label Casablanca had just released a double album of audio highlights from the Tonight Show whose poor sales threatened both company and band. Though the promising New York City group had made headlines with its kabuki makeup, sci-fi wardrobe, and onstage stunts, Kiss’ three albums to date hadn’t made much of a stir. In desperation, label boss Neil Bogart recorded the band’s concerts that spring and issued Kiss Alive!, finally capturing the band’s manic onstage energy. The album was a hit, the label was saved, and the Johnny Carson debacle averted. Most importantly, Kiss itself reached superstardom. 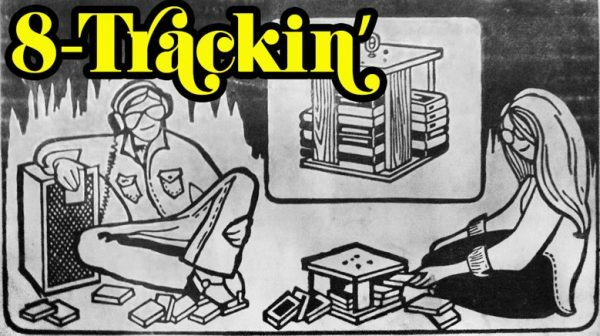 Over the next two years — fall 1975 to fall 1977 — the band hit its artistic and commercial peak with three smash studio albums, eight charting singles, sellout shows, and an explosion in merchandise sales. But the grueling schedule took its toll on Kiss. 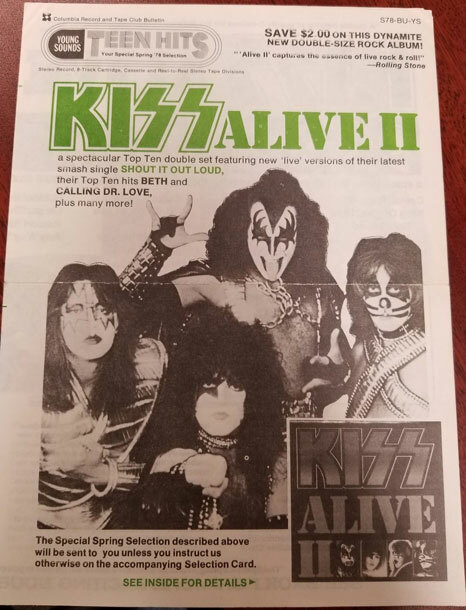 To release new product while the band was developing its next album project(s), Bogart again recorded the band live, and wouldn’t you know it: Kiss Alive II sold even more copies than its predecessor, earning platinum status where Alive! had only struck gold. Together, the two albums bookend what’s arguably Kiss’ golden era. But which album is the greatest of all time? Let’s look at the highs and lows of each — on 8-track, of course! Best songs: Probably an unpopular opinion but I’ll go with Alive II. 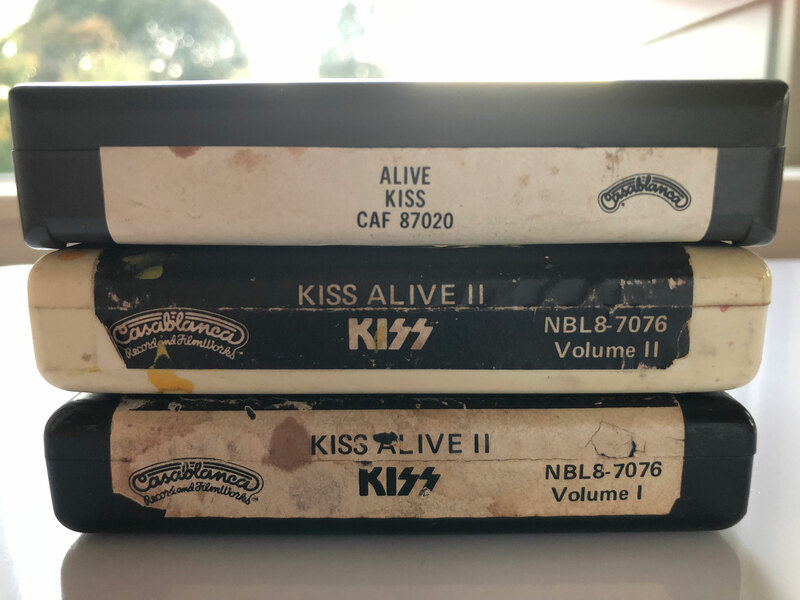 Sure, Alive has the bulk of the classic Kiss songs, but the songwriting’s a little better on the sequel. 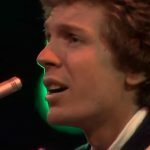 The band was incorporating more influences and writing in different styles than just hard rock: power pop (“Shout It Out Loud”) ballads (“Beth,” perhaps the first power ballad), and country (“Hard Luck Woman,” “Tomorrow And Tonight”). Best playing: Again I’ll say Alive II. At this point the band had nailed the standard Kiss groove and were free to embellish it with new sounds. Plus after 18 months of heavy touring they got to be even better players. The first two tracks on the Alive II tape feature spectacular Allmans-style dual-lead guitar solos by Paul Stanley and Ace Frehley. The album also features searing solos by outside guitarist Bob Kulick on a few studio cuts Frehley was unavailable for. By comparison, the musicianship on Alive, though solid, is a bit more brute-force garage rock in style. Best solos: Gotta be Alive!, if only because the songs are longer. The average song length on Alive! Is 4:53, room for a nice guitar or drum break, while the Alive II songs are a pop-song 3:34 on average. “She” and “Black Diamond” both feature long, smokin’ guitar solos in the Jimmy Page style, while “100,000 Years” includes a very long drum break — even if Paul Stanley shouts over most of it! Best “audience”: Though both albums are live recordings, they’re heavily overdubbed with additional audience noise. In theory I have no problem with this, but the execution is frankly poor on both albums: it sounds like a tape loop of football cheers fading in and out. I’ll give the edge to Alive II on the strength of “Beth.” Recorded live at Budokan, the track seems to feature an audience that’s actually responding to the music; hand claps on the beat prove that this is no fake. 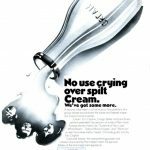 Best body ads: What can I say, the members (!) of Kiss like to sing about their junk. The three main examples are on Alive II: Paul Stanley calls his goods a “Love Gun,” while Ace Frehley offers some lucky lady a “Rocket Ride.” Not to be outdone, on “Larger Than Life” Gene Simmons boasts about his size: “You can’t believe your eyes, my love is too much to hold.” I couldn’t believe my ears: this amazing, catchy song is unlike everything else on these albums, a sick, lowdown funk groove a la Zep (“When The Levee Breaks”) or Billy Squier (“The Stroke”). Definitely a high point in the Alive franchise. Most rock anthems: Still, Kiss could write great songs about jammin’ and partyin’, including their signature tune “Rock And Roll All Nite” (the Alive! version was an even bigger hit than the original). Alive II has a bunch of these: “Detroit Rock City,” “King Of The Night Time World,” “Tomorrow And Tonight” (“we can rock all day, we can roll all night” sounds awfully familiar), and the mighty “Shout It Out Loud” (a well-earned hit in its live version here). Most rockin’: On Alive II, the band sounds sparkling and versatile. But I’ll stick with the dirty, basic crunch of Alive!. Kiss sounds like a competent New York City post-garage band (a la The Good Rats) dreaming of greater things, and it’s really thrilling to hear them striving for god-of-thunder-hood. Best album: Sequels seldom live up to the promise of the original, and that’s the case here, too. Alive! really gives the sense of being at a rock show and gives thrilling new life to songs that had failed to sparkle as studio cuts. Alive II offers fine renditions of the band’s recent hits and a whole batch of new studio material (without fake audience noise), but it still feels like a hodgepodge, not a single gig. 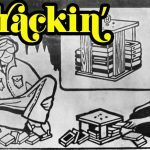 Best 8-track: You’ve noticed from the pictures that Alive! (shown as a Columbia record-club tape) is a single tape and Alive II spans two cartridges. Since Alive! 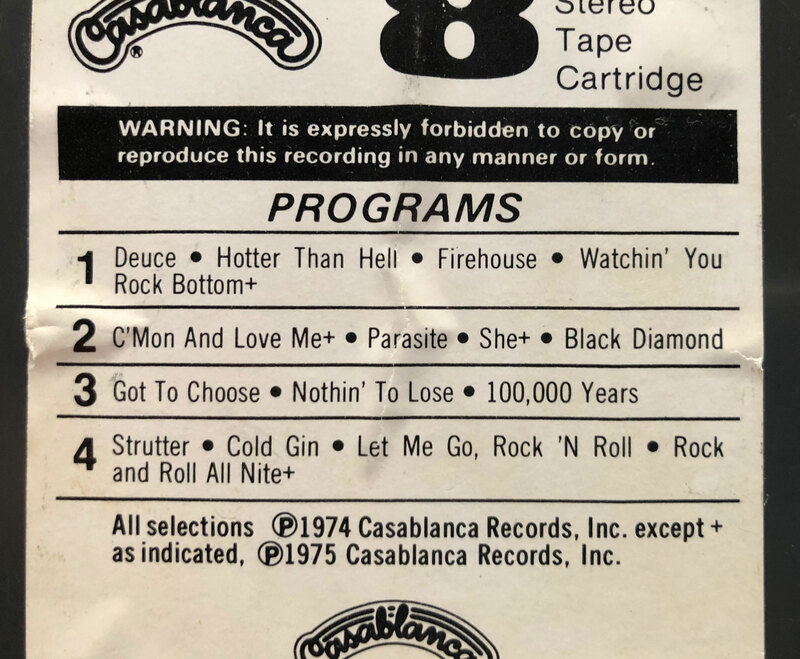 is actually a longer album than its sequel, the reason for the dual-tape edition is baffling; likely it allowed Casablanca to charge more for Alive II. The shorter programs on II really kill it for me; 2-3 songs and then ka-chunk. And splitting the hit “Calling Dr. Love” is unforgivable. But hell, get all three tapes and enjoy the greatest rock story ever told. Nice article, Andrew! Glad the Columbia House flyer tucked inside my vinyl LP copy of ALIVE II (along with the remaining unused tattoos… wonder if those still work after 40 years?) came in handy! 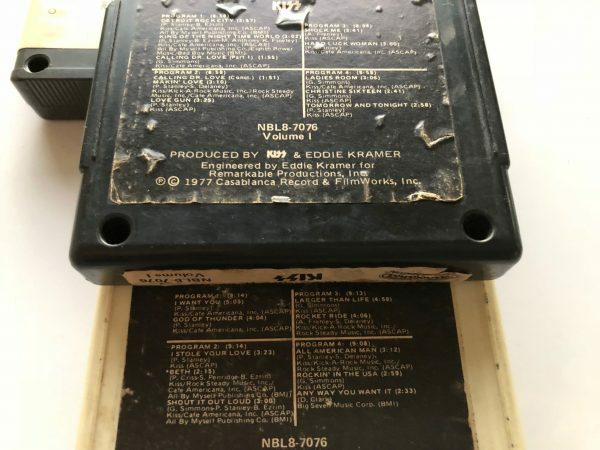 Another element of the 8-track releases of the album not present in my pictures is the “Special Offer” promos of both releases. 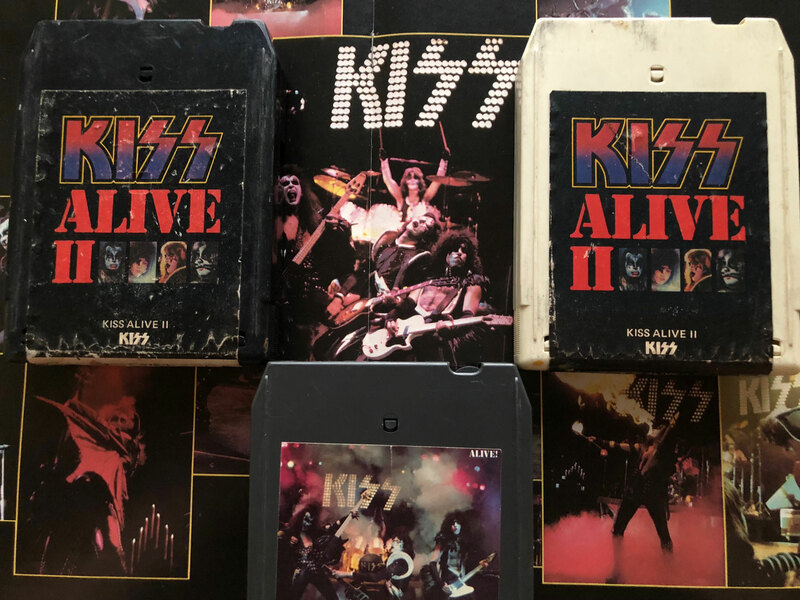 Both LP versions included glossy 8-page, LP-size photo booklets (the Alive II book is entitled “The Evolution of KISS”), and the record company made these available to 8-track buyers as well. Alive! included the “Special Offer” mail-in info printed on the cartridge label itself in place of album cover art (which was presumably on a custom cardboard slipcase). Alive II included the mail-in offer on an insert card included in the double-cartridge set. Cost for the first album’s booklet was a mere 50¢ but by Alive II the price had gone up to $1. Just to bring things full circle… by 1996 all transgressions against KISS in the name of the “Tonight Show” were totally forgiven. Could there be better proof of this? In the wake of the 1996 reunion of the original 4 members of KISS, with the makeup going back on, a live compilation YOU WANTED THE BEST, YOU GOT THE BEST, combining songs from ALIVE! 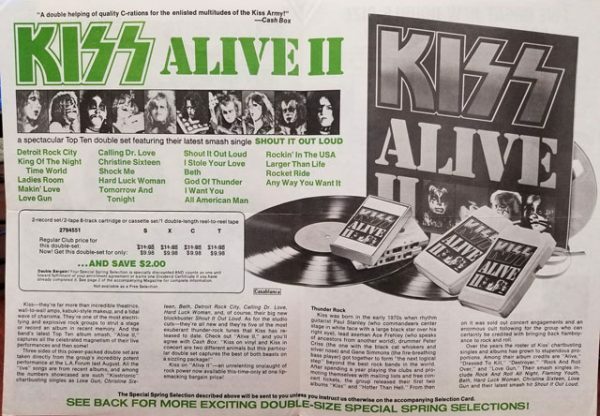 and ALIVE II with several “new” songs, a 17-minute interview with Jay Leno (then-current host of “The Tonight Show”) was included, both on CD and vinyl versions (sorry, no 8-track… unless we roll our own! ).